New numbers released by Statistics Canada are raising questions about the future of the Inuttitut language in Labrador. The agency says just 25 per cent of people in Nunatsiavut speak an aboriginal language. Inuttitut, the dialect of Inuktitut spoken in Nunatsiavut, is taught at some schools in Labrador but not all. 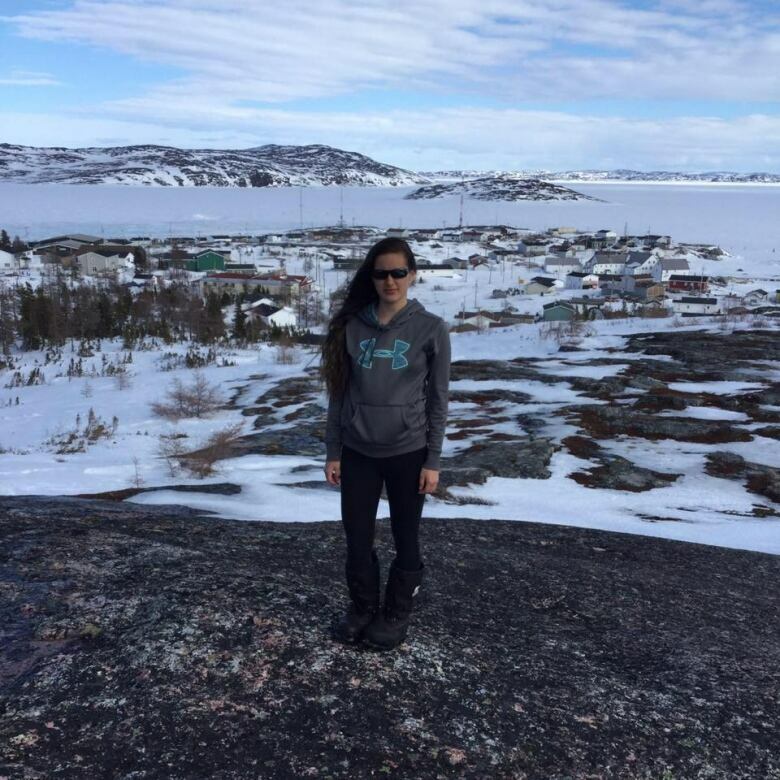 "Growing up in Nain I took Inuttitut from Kindergarten to Grade 9," said Caitlyn Baikie, who now lives in Ottawa. "I can understand a lot better than I can speak in Inuttitut and I know short phrases and isolated words, but I am by no means bilingual." Students in Nain and Hopedale take core competency classes starting in kindergarten up to Grade 12. There's also an immersion program for kindergarten and Grade 1 students in Nain. Brenda Flowers, who is in Grade 11 in Hopedale went a step further. She regularly competes in Inuttitut language speak offs, but even she said she's still not fluent. "I wouldn't say I'm bilingual but I hope can say it soon enough. When I get older." Baikie, Flowers, and others in Nain and Hopedale have had thorough language training compared to Inuit who grow up in other communities. Matthew Pike is a Nunatsiavut beneficiary who was born and raised in Happy Valley-Goose Bay, where schools teach French as a second language. "If I had the opportunity growing up to learn my native tongue, my grandmother's native tongue, my goodness, I'm sure my mother would have jumped at that opportunity," he said. The Nunatsiavut government has a 50-year strategy to revitalize the language with a view to make Inuttitut the dominant language in the region, and there are opportunities outside the school system to learn the language. Rosetta Stone software, early childhood education, and speaking competitions are some of the ways people in the region can learn and develop their Inuttitut language skills. Brenda Flowers says that even though she regularly participates in Inuttitut speaking competitions, she still doesn't have enough experience speaking the language to be fluent. But youth like Baikie, Pike, and Flowers say very few people that are their age or their parents age speak Inuttitut. "My grandmother grew up, her first language is Inuttitut, she learned English and because of the timing that she had children, she felt that it was not of value to them because she was ashamed of being Inuk for a certain period of her life," said Baikie. She believes language training is just one part of bringing the language back — the lingering effects of shame about Inuit identity must also be confronted. "Our language is really the root of who we are," Baikie said. "I wish that within my own family and within my own community that it was seen more as a value to learn Inuttitut and that it had a real place in our society." For Inuit who grow up without learning Inuttitut at home or in school, Pike says the task of learning later in life is daunting. "It's a deeply personal commitment and in the reality of today, people are busy, people have families, people have careers," he said. "But we find ourselves in a situation where, through no fault of our own, and we all know the history of why the language is not spoken anymore, we find ourselves in a position where the language is likely going to be endangered or threatened and will die off with the elders that speak it right now." Earlier this month, Johannes Lampe was acclaimed as President of Nunatsiavut after no one else entered the race. Pike says he knows other people who were interested in running, but weren't eligible because they don't speak Inuttitut. "The people of Nunatsiavut were denied a presidential campaign recently because of a language that was basically stripped away from us by past government policy aimed at destroying culture." Pike said. He wants Nunatsiavut beneficiaries to rethink the language requirement. "There's a way in the constitution to change the requirement. It requires a referendum and approval of more that 50 per cent of the Nunatsiavut beneficiaries, and also the majority consent of the Assembly." Not everyone agrees. Baikie says Nunatsiavut is the only Inuit region with a language requirement for its leadership. "I feel conflicted about that requirement, I completely value that it's there," she said, "But with our current status of the amount of people who can't speak Inuttitut it's something that we should look a little closer at." Unless there is a sharp increase in people who can speak the language, Flowers said there may not be anyone eligible to run for president in just a couple decades. "Realistically, I don't think so. But I would hope," she said.